#ATIA15 Reflection: Light years ahead of the past, but who is being left behind. Sitting here looking out at the snow falling, reflecting on the fact that just two days ago I was sitting in sunny Orlando! The only nice thing is the snow led to a snow day. What brought me to Orlando was the annual Assistive Technology Industry Association (ATIA) conference. This is my second year attending this amazing event with attendees coming from across the globe. It is intriguing to see all the technology that has infused into the field of special education. My work in the field has always followed a diverse path from my early days volunteering in a pre-school rehabilitation program while in high school to experiences in just about every area of Special Ed while at Connecticut College. I had even transferred from the amazing master’s program I was in at Northwestern that was solely focused on specific learning disabilities (SLD), to the program at George Mason University that was a more global special education degree. I have always from those early years been interested in technology with regard to special education. In college, I did an independent study, research paper that explores software and switches to meet various needs of children with special needs. Funny though now I end up teaching kids with SLD, but attending such a conference today still catches my interest as to how the field of assistive technology (AT) has developed and grown to incorporate new developments in tech. The devices and tools that are available for special education filled a massive room. Communication boards that I recall making with paper and Velcro boards, now are incorporating tablets and other technologies that never existed before. Tools used to enhance access to content for those with vision and hearing impairments are technological wonders compared to my experiences long ago. Robots aren’t just for MakerSpaces, but tools to be assistive as well. And let’s not ignore the apps, Chrome extensions, and websites that exist across the board of support for those with disabilities, their families and educators as well. However, among all of this amazing technology, along with poignant sessions and conversations around special education, I am left thinking, what about those with specific learning disabilities (SLD) (i.e. dyslexia, ADHD, dysgraphia, dyscalculia, auditory processing, executive function, etc..)? Yes, there are a few companies that have apps/software to address the needs of these learners, but mostly it is up to educators to find and explore the apps/tools/sites that meet the needs of these learners. Really the problem is that the conversation around the use, incorporation and engagement of technology for students with SLD is disconnected. In my personal view, it does not seem to be fitting into the regular education world, and seems to be the quiet little sister of the special education world. Part of this, in my view, is that the SLD is 1. Not fully understood 2. The hidden disability 3. Not being heard loud enough. At the ATIA, there are only a select few sessions in the two and a half days that specifically address the use of technology with SLD. Yes, there were sessions that shared apps, Chrome extensions, and websites that incorporated all areas of special education, including SLD; however, how we incorporate those with SLD versus other disabilities I feel needs its own conversation. As with all the disabilities that exist, the SLD has its own, broad scope of how and why to use technology to support, engage and enhance learning. Even with the many strands of focus for ATIA, there is not one for SLD/Dyslexia. I am one of those voices working to spread the idea of #DyslexiaTech. I am continuously sharing ideas, thoughts, strategies, articles and the like with colleagues in the regular ed world. I have presented at several conferences that are attended by regular educators on the apps we use at my school (Eagle Hill-Southport) to build learners who can help themselves while we help them build their skills. Sadly though what I hear from educators and parents is that getting these tools into the learning spaces of SLD learners is a challenge. Some schools will not allow SLD learners to use the tools in school, despite some parents being willing to even provide the tool. 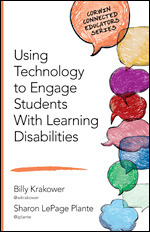 Other schools have them, but don’t have the information nor the training to truly support students using tech as an assistive tool. Then there is the HUGE misunderstanding that using tech is “cheating” or giving “a leg up” to those with SLD so it isn’t allowed. At this conference, a parent who attended a session I ran, shared how her high school aged student was provided an aide, but not a device to help with reading and such. So rather than building this girl’s independence with technology, she is given a salaried adult to do this. What happens when this girl goes to college? And can’t this educator be then used in a more productive way? I was impressed with this mother for attending this conference to learn tools and strategies she could bring back to support her daughter. This brings to a key point that I see happening in the SLD/Dyslexia world… the parent movement to make a difference. There are many of us educators in the field trying to shout from the rooftops, but we are widespread. The grassroots movement of Decoding Dyslexia is amazing and impressive. These parent-run organizations that cross from “sea to shining sea” are doing an astounding job of bringing the low rumble of voices to a loud and proud shout! Parent organizations are not new to this, with those such as Smart Kids with Learning Disabilities and Parents Education Network doing this for years. However, it is the nationwide collective that has grown from Decoding Dyslexia that takes the amazing work of these organizations to a whole new level. So my hope is that we can find a home for #DyslexiaTech whether it be in the regular ed world, special ed world, or on an island of its own. With today’s technology, it is easier to do, and as I have seen with my students, is welcomed because it is everyday tech that is incorporated. The word needs to be spread that the use of technology for SLD/Dyslexia just helps level the playing field for learners. It allows them to access content and demonstrate knowledge utilizing their strengths while supporting areas of identified weakness. So will you join in and share the fight to give #DyslexiaTech it’s place?